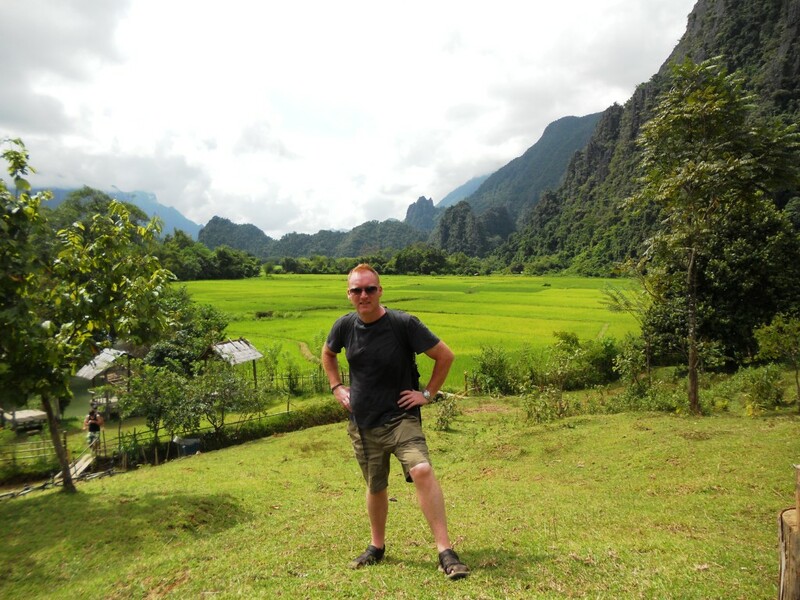 Vang Vieng is a wonderful little place to chill for a few days. 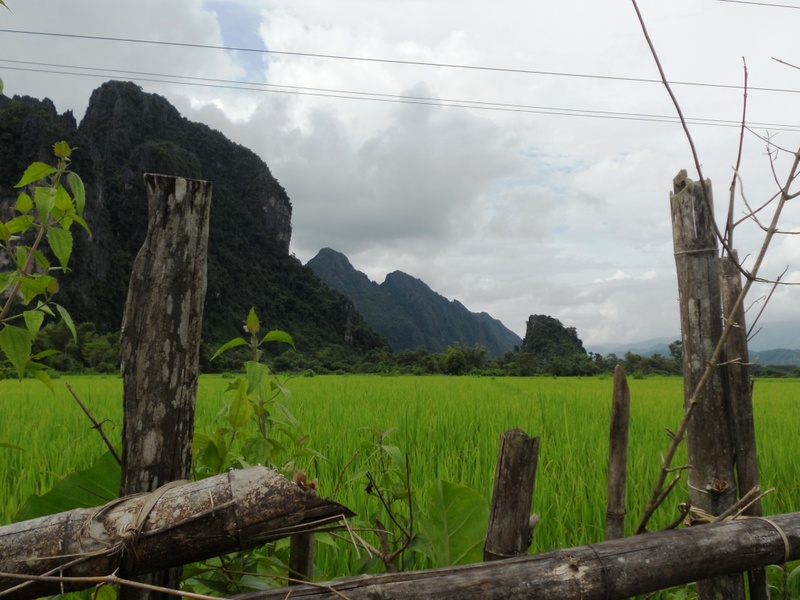 Surrounded by beautiful mountain scenery – which are actually limestone karst’s – and vivid green rice fields, the place is really small, with a village feel. The town is heavily geared up for young traveller’s who basically reach this destination for the “tubing”. This where you are transported 3 miles upstream and float down the river on a spare tractor tyre inner tube, stopping at bars en route back to Vang Vieng. After a night or two here, we got used to the sight of the young’uns walking up the street, soaked to the skin, loud and boisterous after sinking multiple “buckets” of local cocktails. We also saw quite a few injured, and we were told that there has been 15 deaths so far this year on the river. Mostly caused by a combination high fast water during the rainy season and people getting into difficulties due to too much booze. We are experiencing real extremes of weather. Although always hot, sometimes just damn hot, the last of the monsoon rains have been really teaming it down. It only lasts and hour or two, but it is torrential, and seems to happen at any time of the day, which can make planning the day a bit difficult. We decided to give the “tubing” a miss, and hire a motorbike to take ourselves out to the countryside, and visit The Blue Lagoon. As we left the main road, the terrain got progressively worse. Red muddy rough roads, covered in craters and rocks, with large pools made from the earlier monsoon rains made the ride more than a bit treacherous. 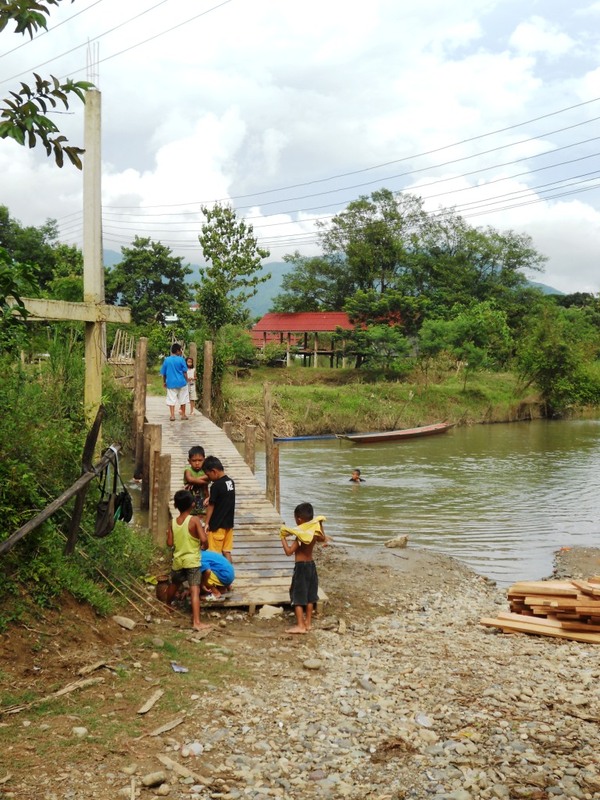 Although we took our time, the 6km journey took over an hour as we passed little village communes where small kids would spot us excitingly shouting “Hello’s” with friendly smiles, and with stunning scenery all around us. One little girl stopped us, she must have been about only 3 years old, and she was trying “high five” us as we snailed past. 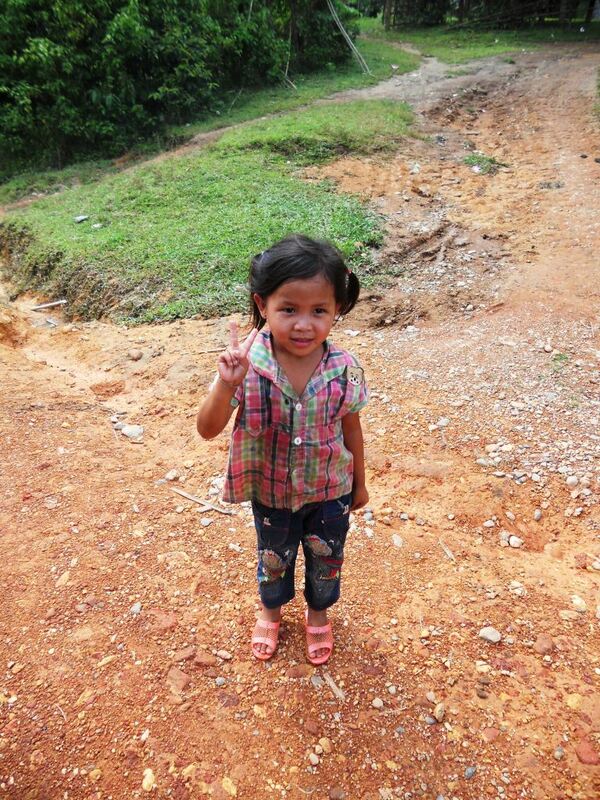 We stopped for a photo, and as cute as anything, she realised what was happening, and posed for the camera. In return, she seemed to be pointing at Michelle’s wristbands, most of which have been gifts from friends. We were quite happy to see her little face light up when I offered her one of mines instead. The Blue Lagoon was nothing like we envisaged, much smaller, and more green than blue, but the setting was particularly picturesque. We decided to head back a little earlier, as we anticipated a heavy thunderstorm brewing due to the large dark clouds that were gathering in the not to far distance. We had a ride about town to see a bit of the place before returning the bike before dark. There are endless bars/restaurants to cater for these young tourists. Each bar seems to be almost identical, with identical menus selling local dishes, western dishes with tasty baguette and full breakfasts. 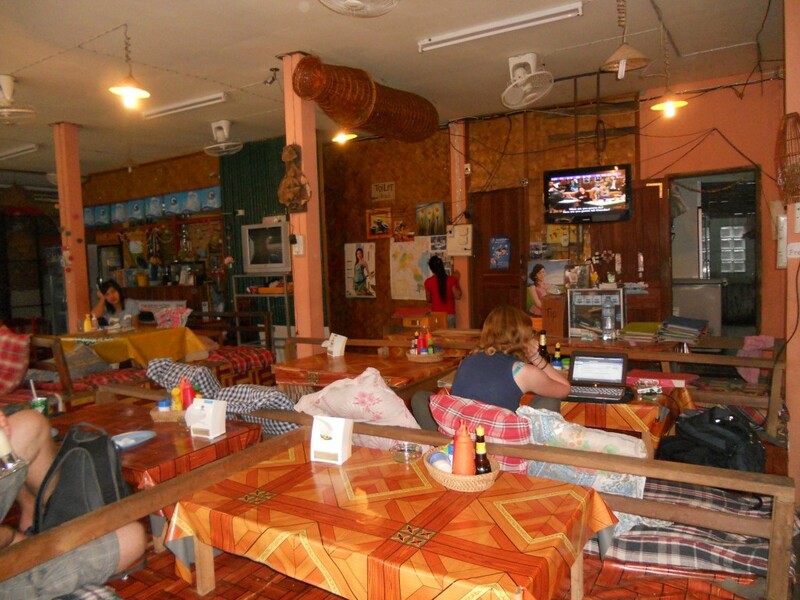 Each little place has raised seating areas with little low slung tables and scatter cushions, and all have free WIFI and televisions screening continual looped episodes of Friends, Family Guy, The Simpsons and Southpark. It is quite lazy, but when the rain is on, you can spend a good few hours in these places. There are some great riverside bars, and it is great to sit and chill, watching kids strip off and jump in the river, fly down at speed with the current, then hit the banks and the small bridges to come back and do this all over again. 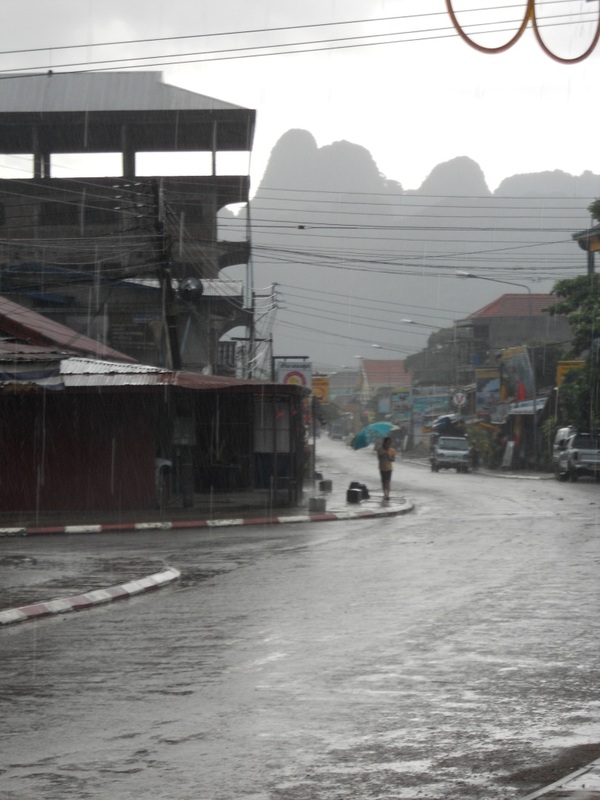 A few days here then before heading North to Luang Prabang – a journey that should take around 5 hours, however, we were warned by an Ozzie girl that we had met one night that landslides can create major delays. 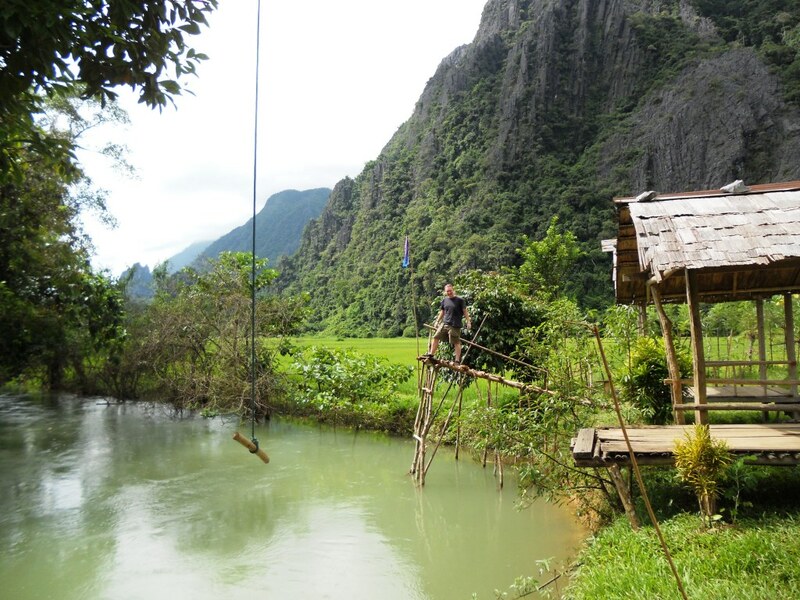 We had heard travel in Laos could be difficult, and we were to find this out for ourselves’ very soon.